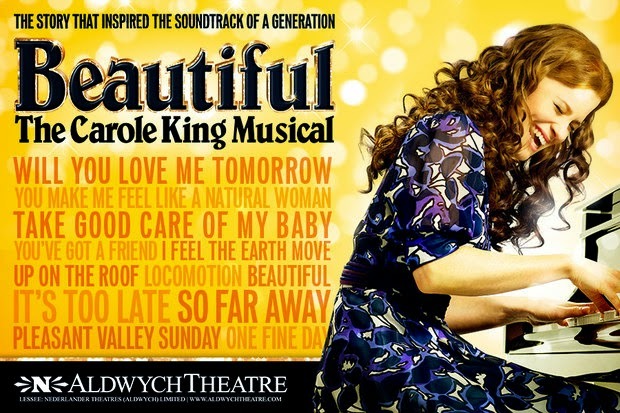 Where Broadway leads, the West End will surely follow and so it is little surprise that Tony-winning Beautiful – The Carole King Musical found its way over here to the Aldwych Theatre. And I’m pleased to report that the transatlantic passage has gone most smoothly indeed to deliver an absolute treat of a show. When three of its four leading personnel are still very much alive and kicking, it is perhaps no surprise that Douglas McGrath’s book treads a rather respectable path through the first ten years of King’s career. But then she would be the first to say, with typical self-deprecating charm, that her life is hardly the most exciting, her dreams never the loftiest – it just so happens that beneath this veneer of ordinariness lay an absolute treasure trove of extraordinary music. And as musical gem follows musical gem – both from the collaborations of King and sometime partner Gerry Goffin, and also from their friends and writing rivals Cynthia Weil and Barry Mann – this feels utterly the point. Life isn’t always chock-a-block with drama, motivations don’t always have to spring from some momentous event, the cult of the tortured artistic soul is far from the be all and end all (Billington seems to suggest being “a shy, well-adjusted woman struggling to reconcile a career with a failing marriage” is something of a crime!) and I’d say that Beautiful is no weaker a biopic for not having such narrative peaks and troughs, reinventing personal history in the name of drama. The show remains understated throughout, even when bigger issues feel like they may come to light – the racial politics of being the co-writer of the first African-American girl group number one in ‘Will You Love Me Tomorrow’, the sexual politics of being a highly successful woman in a male-dominated business. Rather, emotional vibrancy comes out of the normalcy of life – Lorna Want pairs Weil’s wonderfully dry wit with real heart when it comes to the galumphing charms of the ever-faithful and adorably geeky Ian McIntosh as Mann and that the end result of their competitive feelings towards King and Goffin is a trade-off of number one hit records and an awkward abortive game of strip poker is symptomatic of the world of this show. And Katie Brayben gives a fabulously star-making turn as King herself, animated gorgeously every time she sits at a piano and shares the gift of her musical genius, suggesting the individual traits of the woman but never reducing her performance to an imitation, finding her own take on the unaffected purity that resonated with so many millions of record buyers. Brayben also nails the expressive feeling of the (fake) keyboard playing perfectly as well, the sound may be coming from the band but you just know that she’s note perfect anyway, this really is the perfect marriage of actor and role at the ideal time in her career which will surely be long and fruitful. Derek McLane’s glossy scenic design allows the show to feel like a glamorous version of Top of the Pops, especially when the hit songs are being reeled off by the like of The Shirelles and The Drifters and the perky energy of Little Eva (who was the babysitter for King and Goffin’s daughter). And Marc Bruni’s direction keeps things big and bright to ensure the whole shebang ticks over just so. There might be more deeply insightful biographical musicals around but Beautiful has one of the best performances in town in Brayben and one of the most glorious collections of songs to make it a hugely enjoyable evening indeed. Read my review of the US soundtrack here and my preview of the show here.